Members of the Puget Sound and Columbia estuary’s south resident orca population. 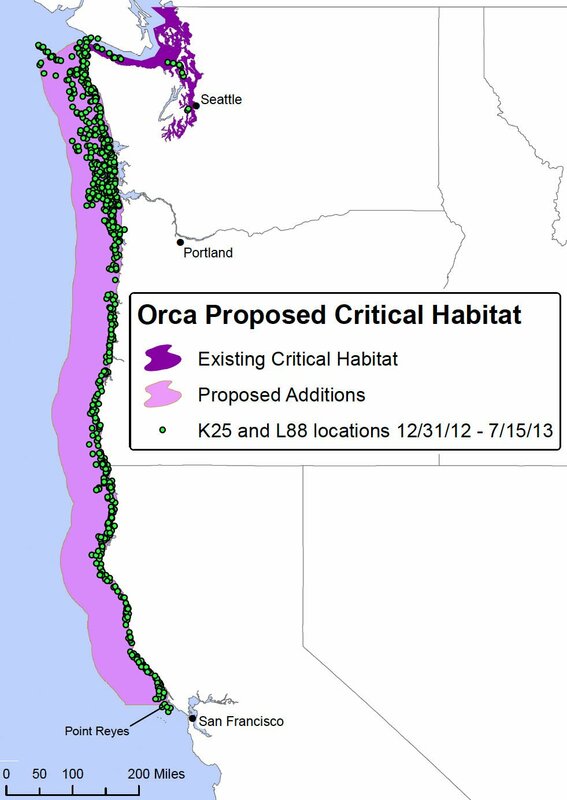 Based on satellite tracking that found tagged Puget Sound orcas at the locations marked in green, an environmental group in 2014 proposed a large expansion in the area designated as critical habitat. Southern Resident Killer Whales have come to achieve nearly unanimous popularity in the communities surrounding Puget Sound, acquiring folk hero status in the past half century. Their trials and tribulations are fodder for endless coverage on Seattle TV news; 153,000 people belong to the Orca Network on Facebook, devoted to fan mail and reporting up-to-the-minute sightings. Their perils are real. Numbering a scant 75, they struggle to produce young. Some suffer from malnutrition. This has sparked concerted efforts by Washington state and federal agencies to understand what ails them and how best to respond. On April 3, the Center for Biological Diversity and Wild Fish Conservancy sued in federal court, alleging the National Oceanic and Atmospheric Administration — which oversees ocean fisheries — isn’t doing what it should to ensure an adequate stock of the orcas’ favorite menu item, Chinook salmon. 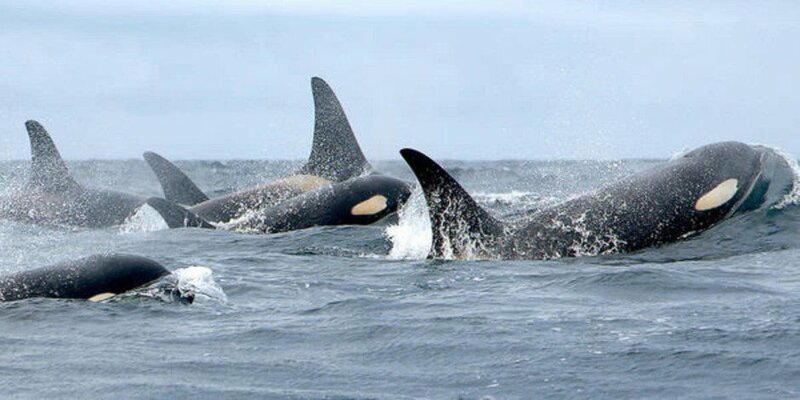 Until a satellite-tracking program between 2012 and 2016, it was little realized that Puget Sound’s orcas should really be considered residents of the entire Pacific Northwest coast. The satellite found them ranging down the outer coast in the winter and spring on a fast and perpetual quest for salmon. Although tracking was discontinued after an orca died from a tag-related wound, it’s clear that the whales go where the salmon are — or at least where they think they’ll be. Earlier this month, about three dozen were observed in Monterey Bay. Based on past behavior, they’ll circle back toward the north, focusing much of their hunt on the Columbia River plume, returning to the Strait of Juan de Fuca after all the possibilities are exhausted here. While the lawsuit doesn’t demand explicit action items (see tinyurl.com/Orca-Salmon-lawsuit), instead calling on the court to rule that NOAA is violating the Endangered Species Act, a favorable ruling could result in a cavalcade of responses. In the immediate term, Chinook fishing seasons might be curtailed when orcas are present or face a long-term hiatus in an effort to rebuild salmon stocks. While Washington state is ramping up production of hatchery salmon to provide more for all user groups including orca, the presence of the Wild Fish Conservancy in the litigation suggests a broader aim. Conceivably, this might include wholesale changes in watershed and fisheries management in hopes of producing mammoth-size salmon like orcas once relied upon.